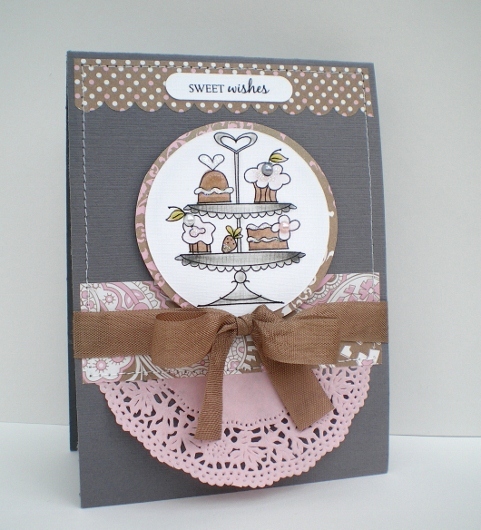 And here's the finished card that you saw the makings of in my last post, it's for sketch 121 over at Card Patterns. I've had this Basic Gray cardstock from Stampin Up for a while now and finally cracked it open today. I had to, my Kraft cardstock is running low, 12 sheets of 12 x 12 gone in a flash must be time for a change. I've coloured the image with chalks and Promarkers﻿. I have to admit shading isn't my strong point but I can see an improvement which keeps me happy! So pretty, so elegant and so typically, Vicky!! lol It's another gorgeous card, as always!! 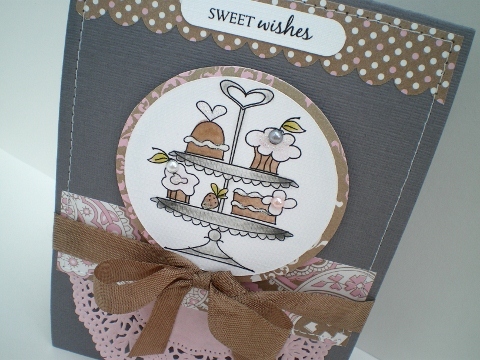 Great idea to include a doily with your cupcake theme. Beautiful card. Super super cute Vicki! Thank you for playing with us at Card Patterns! Well I would have never thought of putting grey and brown together but it certainly works and looks fab on this absolutely beautiful card. I tried posting a comment yesterday but blogger wasn't having any of it lol. Hope you have a lovely weekend Vicky. Beautiful card! Love all the added details. :-) I'm a new follower. Congrats on being the winning card this week! You go girl! Great work!